The Lotterys are an unconventional family. Their name was adopted after they won the lottery which enabled them to give up their jobs and live the life they dreamed about. Partnered together are two dads and two mums. Their seven children are a diverse mixture of biological, adopted, handed over and gender-challenged. They live a hippie life, are educated by doing, and together with five pets are an intelligent and supremely happy group. Their existence goes askew when they get a call to go and collect PopCorn’s elderly father from Yukon after he sets fire to his house and has nowhere else to go. It is to be a temporary arrangement. Grumps, as the children name their grandfather, is unable to move into the modern era. He has great difficulty accepting the Lotterys’ life choices. He’s rude, angry, intolerant and cranky. Soon, all the kids just want him gone. They want their hectic life back and especially their peace of mind. But with family, ties of blood are not that easily broken. Will the existing menagerie be able to accommodate an old misfit? 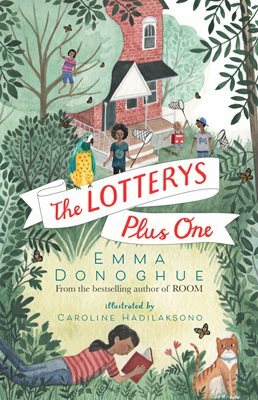 This is Emma Donoghue’s first novel for children. Brilliant use of language keeps the brain cells sparking. Filled with humour, the unexpected, and a great many life lessons, the writer steers the story so carefully that the reader clearly sees both sides, and sympathises with them simultaneously. This book sizzles. There’s not a moment of boring in it. It flicks from scene to scene in rapid movement but is still captured by the mind’s eye. I could see everything playing out before me as I read.